The list of Works Cited is an alphabetical list of sources that you used to gather information for your research paper. You place this Works Cited list at the end of your research paper. 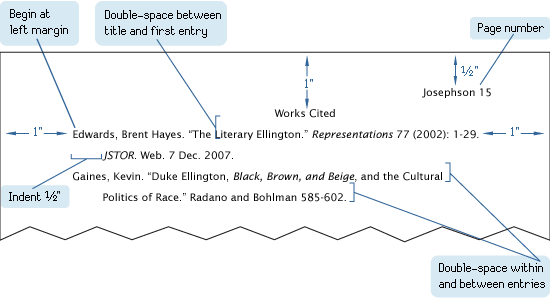 Page Format: Use the heading “Works Cited” centered one inch below the top edge of a new page. Do not bold or underline this heading. Page Number: Begin the list on a new page and number each page, continuing the page numbers of the research paper. For example, if the text of your research paper ends on page 10, the works-cited list begins on page 11. The page number appears in the upper right-hand corner, half an inch from the top and flush with the right margin. Indentation: Do not indent the first line of each entry. If an entry runs more than one line, indent the subsequent line or lines 1/2 inch from the left margin. Spacing: Double-space the entire list, both between and within entries. Continue the list on as many pages as necessary. Alphabetizing: Alphabetize entries in your list of works cited by the author’s last name, using the letter-by-letter system. In this system, the order of names is determined by the letters before the commas that separate last names and first names. Spaces and other punctuation marks are ignored. The letters following the commas are considered only when two or more last names are identical. A, An and The are ignored. List in your Works Cited only the entries which were actually cited within your text. All entries in the list of Works Cited, the Publication Medium (i.e. Print, Web, DVD, Television, etc.) must be included. Dates are written in MLA format, Day Month Year, with the longer months abbreviated. For example: 7 Feb. 1996. Indicate When Data is Missing: Many sources do not have a date, publisher or pagination. MLA advises, where applicable, to write n. pag. for those sources without page numbers, n.d. for no date, and n.p. if name of the publisher or place of publication is omitted. The URLs for web sources are now optional. MLA suggests not using them but recognizes that some educators might still require them. Therefore, ask your teacher if he/she requires URLs for your web sources. Generate your works cited and bibliography page automatically using a program, visit here for more details on these tools. NOTE: Name of author inverted = author’s last name, author’s first name. Name of author inverted. Title of book. Place of publication: Name of publisher, Year of publication. Print. Lipson, Charles. Reliable Partners: How Democracies Have Made a Separate Piece. Princeton: Princeton UP, 2003. Print. Author’s first name, last name, Author’s first name Author’s last name. Title of book. Place of publication: Name of publisher, Year of publication. Print. Binder, Guyora, and Robert Weisberg. Literary Criticisms of Law. Princeton: Princeton UP, 2000. Print. Name of author inverted. Title. Ed. Editor’s first name Editor’s last name. Place: Pub, Year. Print. Shakespeare, William. Hamlet. Ed. Barbara A. Mowat and Paul Werstine. New York: Washington Square-Pocket, 1992. Print. Name of author inverted. “Title of work.” Title of Anthology. Ed. Editor’s first and last name. Place: Pub, Year. Pages of work. Print. Peterson, Nancy J. “Toni Morrison: A Critical Look.” Toni Morrison: Critical and Theoretical Approaches. Ed. Nancy Peterson. Baltimore: Johns Hopkins UP, 1997. 221-76. Print. Name of author inverted. Title of Play. Title of Textbook. Ed. editor’s name. Place: Pub, Year. Pages. Print. Miller, Arthur. The Crucible. Elements of Literature. Fifth Course. Ed. Kathleen Daniel, et al. Austin: Holt, Rinehart and Winston, 2000. 829-887. Print. Name of author inverted. “Article title.” Title. Edition. Date. Print. Hernandez, Tomas. “Portugal.” The World Book. International ed. 1999. Print. Title. Ed. Editor’s last name, first name. Place: Pub, Year. Print. The New Jerusalem Bible. Ed. Henry Wansbrough. New York: Doubleday, 1985. Print. Name of author inverted. “Title of article.” Name of periodical (omit any introductory a, an, or the) Volume number or issue number (Date of publication): Page numbers for the entire article. Print. Beets, Nicholas. “Historical Actuality and Bodily Experience.” Humanitas 2.1 (1966): 15-28. Print. Where 2.1 means: volume 2, issue 1. Name of author inverted.Full Title. Publisher, Publication date. Web. Access date. Nguyen, Stephen. MLA Format Works Cited. 17 Oct. 2011. Web. 11 Feb. 2012. Name of author inverted. “Article Title.” Name of Newspaper Year or date of publication: page numbers. Print. Harris, Nicole. “Airports in the Throes of Change.” Wall Street Journal 27 Mar. 2002: B1+. Print. Name of author inverted. “Article Title.” Name of Newspaper Year or date of publication: page numbers. Web. Access date. Achen, Joel. “America’s River.” Washington Post 5 May 2002. Web. 27 Feb. 2012. Name of author inverted. “Article Title.” Magazine Title. Date: Pages. Print. Simpson, Rhonda P. “Exercising in the New Millennium: A Plan to Meet the Modern Woman’s Needs.” Health and Fitness 15 June 1995: 56-61. Print. Name of author inverted. “Article Title.” Magazine Title. Date: Pages. Web. Access date. Brooks, David. “The Culture of Martyrdom.” Atlantic Online June 2007. Web. 22 Sept. 2005. Name of author inverted. “Article Title.” Title of Journal Volume (Year): Pages. Print. Melborne, Samuel. “Living in Iran.” Mosaic 19 (1986): 133-49. Print. Name of author inverted. “Article Title.” Title of Journal Volume (Year): Pages. Web. Access date. Sohmer, Steve. “Opening Day at Shakespeare’s Globe.” Journal of Modern Literary Studies 3.1 (1997). Web. 27 May 2009. Palmer, Aaron. “Colors and Blood: Flag Passions of the Confederate South.” History. 2 Mar. 2005: 64-6. ELibrary. ProQuest. Trabuco Hills High School Library. Web. 3 Feb. 2004. “Word searched.” Website Title. Created or updated date if available. Sponsoring organization of applicable. Web. Date of access written in MLA style. “Hysteria.” Bartlett’s Familiar Quotations. 2000. Web. 25 Sept. 2006. Author or Government Agency. Title of publication. Publication Information, date. Print. United States Dept. of Health and Human Services. Healthy People 2010: Understanding and Improving Health. Washington: GPO, 2000. Print. Author or Government Agency. Title of publication. Publication Information, date. Web. United States Dept. of Health and Human Services. Healthy People 2010: Understanding and Improving Health. Washington: GPO, 2000. Web. Name of lecturer inverted. Class Notes. Course. Location. Date of lecture. Lecture. Stewart, Ms. Class Notes. English 3 Honors/IB. Trabuco Hills High School, Mission Viejo. 26 Sept. 2003. Lecture. Name of speaker inverted. “Title of Presentation.” Sponsoring Organization. Location. Date. Interviewee last name, first name. Personal Interview. Date of interview. Title. Dir. Director’s name. Perf. Performer’s name(s). Distributor, year of release. Film. Author. Title. Place of publication. Publisher. Date and any information that could help with retrieval. Medium. Thank you this makes my life easier. That’s just what I needed. A simple explanation without all of the fuss. Thanks a million! This has been truly helpful. Thank you! Thank you so much this has helped me very much! Thank you. This is very useful for my college years.